Carte de la Coste Occidentale d'Afrique - Van Schley c. Antique print, titled: Carte De La Coste Occidentale D'Afrique Depuis le Cap Blanc Jusqu'a Tanit. Kaart van de Westkust van Afrika, van Kaap Blanco Tot aan Tanit. Schley for Bellin, ca 1760. Map shows the area around the Bay of Arguim on the West Coast of Africa from Cape Blanco in the north to Tanit in the south. This is the region of Senegal. Condition - Good, given age. Date - 1747 Overall size - 20.8 x 27.3 cm Image size - 15 x 23.5 cm. 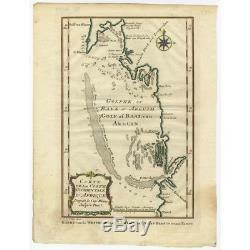 The item "Antique Map of the West Coast of Africa by Van Schley (c. 1760)" is in sale since Sunday, January 21, 2018.